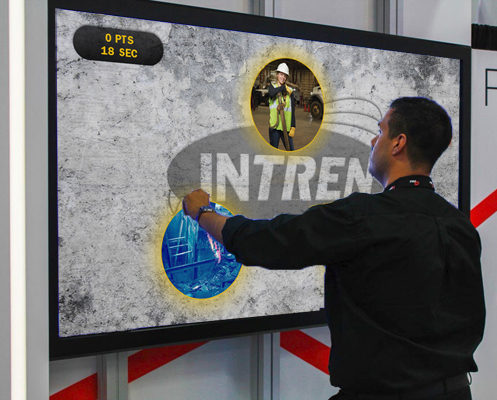 Interactive kiosks can be game changers for trade shows, visitor centers, events or anywhere potential customers congregate. Interactives can build engagement and hype while providing a customized user experience. They allow visitors to interact with your products and services through exploration and gaming on their own terms. Fulfillment – After visitors explore your products and services, they may want to request product literature for themselves, their team or management. Built-in document fulfillment allows the visitor to send whatever digital materials they choose. Or they may want to print out materials right on site. Social media sharing – Your interactive kiosk can be a great vehicle to encourage social media sharing. By providing an engaging experience and simple method for social sharing, let your visitors help spread the word through posting of photos or info through Facebook, Instagram or Twitter. Analytics – Metrics and data collection are a huge benefit of an interactive kiosk and often overlooked. From badge scanning, fulfillment and visitor experience tracking, you can capture value such as visitor usage, social interaction, product interest and traffic flow. Put all this valuable data to use in your marketing efforts to be used for follow up after the show or event. Multi-lingual support – Add multi-lingual capabilities to enhance the audience reach of your interactive kiosk. These capabilities can even be turned on and off depending on the show you are attending. This is a great way to add value to your experience and extend the use of your interactive kiosk. Remote Update/Monitoring – Based on analytics or new developments, you may wish to update your interactive kiosk during operation. Remote monitoring and updating provides usage data and gives the ability to continually update and refresh your kiosk whether or not you have direct access to the hardware. ADA – Extend your audiences reach by ensuring that your kiosk is ADA compliant. From ensuring proper height to EZ Access enhancements, you can expand your volume of visitors by adding in ADA compliant considerations. Multi-platform, multi format – Your interactive kiosk can be customized to play in a vertical or horizontal format and run on any device from tablet or laptop to a large touch screen wall. Product exploration – Show product demonstrations, build custom product configurations and allow visitors to visualize products in 3D space. An interactive presentation allows your visitors to explore your products and services on their own, viewing video, animations, testimonials, sell sheets and even printing materials. Gaming – Gaming is a great way to attract a crowd and an easy way to collect user data, especially when prizes are awarded. Games allow visitors to learn and explore in a fun manner and also can help to build teamwork and generate buzz.